He of the crescent mooned face, caffeine fuelled speech and cinematically passionate soul returns with a vengeance - literally. With several years passing since Tarantino's third feature Jackie Brown, fans can be glad to know that this two-part extravaganza of retribution and dark humour will be hard pressed to disappoint. The impetus for the story came from Uma and Quentin. Thurman plays the angel of death to members of her old assassination squad who double-crossed her after her retirement from the business, wiping out her entire wedding reception (including her unborn child). But, the bride awakens from her coma years later with one thing on her mind - getting even. One by one her ex-team members get picked off in spectacular and creatively violent ways. To a lesser extent than Pulp Fiction, he toys with the conventions of linear narrative structure, jumping around the various main scenes of Thurman's exacting revenge. Tarantino pays homage to a range of his favourite genres, especially those from the East (also including a slice of vicious Japanese Anime). 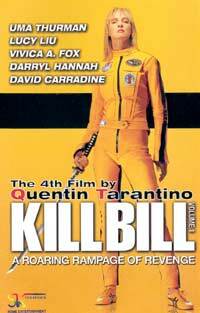 Merciless but bitingly humourous at the same time, Kill Bill Vol.1 has that Tarantino flavour all over it, but not as dialogue intensive as before. It's a blast, making it the most assertive chick-flick in years. Lacking the focused minimalist intensity of Reservoir Dogs and the dialogue rich splendour of Pulp Fiction, Kill Bill Vol.1 does contain his streak, but on a larger scale with a visually broad canvas of great shots adding up to great scenes, whether it is the composition, action construction and choreography, narrative style or moody tone - the musical choice again an integral part. Kill Bill Vol.1 is brutal fun.